Your breasts could be leaking colostrum. You might be experiencing more Braxton Hicks contractions. Although they can at times feel uncomfortable, they’re actually helping to prepare your uterus and cervix for labour and birth. 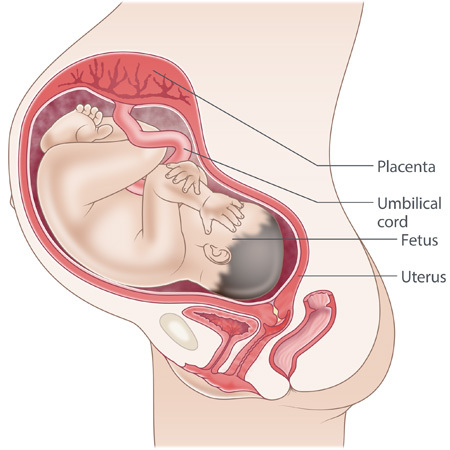 The placenta is about 17-18 cm across, and can weigh up to 1 kg. It processes about 12 litres of blood an hour. If you have a vaginal birth, the placenta will be delivered 5-30 minutes after your baby. It’s recommended that you have an oxytocin injection after the baby’s birth to prevent too much bleeding. If everything’s going smoothly, you’re not likely to need any more scans after 20 weeks. But if you’re having twins or more, or you have a medical condition like gestational diabetes or pre-eclampsia, or you’ve had problems in previous pregnancies, your doctor, obstetrician or midwife might suggest extra scans. Your health professional might also want another scan to check whether your baby is growing normally, whether baby is lying in a breech position or where the placenta is. If you haven’t had a car restraint fitted yet, do this now. It’s illegal for any baby or child under the age of seven years to travel in a car without an approved car restraint. This includes driving home from the hospital or birth centre. Your newborn will need to be seated in a properly fastened, adjusted and approved rear-facing child restraint. Your urge to ‘nest’ could get stronger. You might feel like cleaning, washing, ironing, stocking the cupboard and the freezer … or you might not. Try not to overdo it, and balance nesting with rest and relaxation where possible. Your baby is about 35 cm from head to bottom and, on average, weighs about 3.2 kg. Most of the lanugo – fine covering of hair on your baby's body – has fallen out. But your baby still has a fair bit of vernix – a white, creamy substance that protects your baby’s skin from the amniotic fluid. Your baby’s bowel is full of meconium, which will come out in the first few poos. Your baby’s poos will range from black to green to yellow as baby starts to drink milk. After your baby is born and in your baby’s first week of life, your midwife or doctor will check your baby to make sure everything is all right.